More and more companies are becoming aware of the need to archive their emails and other digital communication data, for both compliance and productivity purposes. An email archive, basically, is a system that automatically obtains messages, attachments, and information about the messages from email servers, and then indexes and stores that information in a read-only format for a specified period of time, depending on the industry’s retention policy. An archive also enables companies to define their own policies, search for messages, and maintain an audit trail of who accessed a message and when. Founded in 2004, Jatheon Technologies Inc. designed the world’s first non-intrusive network appliance. 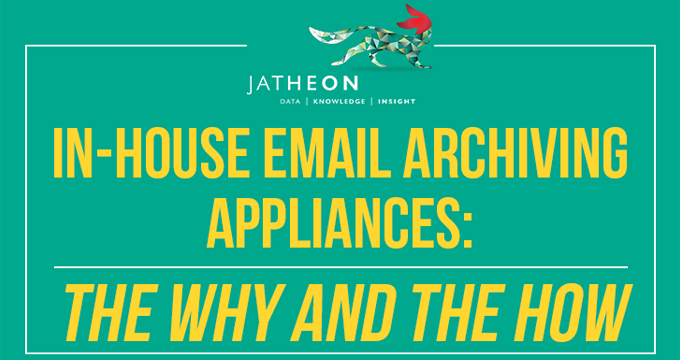 Today, Jatheon continues to raise the bar throughout the industry with its latest enterprise-grade cCore appliance line, and ergo, its powerful email archiving, indexing, retrieval and dynamic monitoring software solution, and best-in-class technical support, The Jatheon Guarantee. Jatheon is headquartered in Toronto, Canada and serves clients worldwide through its network of global business partners.